I am always impressed by the persistence of this woman who urges Christ to heal her sick daughter. Mark, writing to a mainly non-Jewish audience, describes her patient belief in this new message of hope and healing. If we were as unrelenting as this woman in asking for justice and redemption, might not the entire world benefit from our prayers? She is reminiscent of the persistent widow in Luke 18 who badgers the corrupt judge into giving her what she is due. Her continual plea became an embarrassment for this man, and so he gave in . . . to do what ought to have been done in the first place. How do we react to rejection? Do we cave in to harsh criticism? Do we evaluate the words and actions we have heard and seen? Do we put our experience in a proper context to measure its validity? Do we ask God for advice? Do we ignore what has been said entirely without giving it further thought? 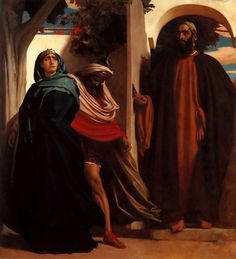 Jesus has gone to Tyre, the city of Jezebel, a pagan center out of reach of the influence of the Jews; and here he encounters a woman who challenges him with his own good news, reminding him that even the lowest of the low deserve respect and fair treatment. What I like about this Greek woman, this Syrophoenician by birth, is that she enters into a dialog with the master and is not cowed by his authority. Perhaps she has lived so long in subjugation she has nothing to lose. There is something to be learned here: that when we experience rejection we ought to evaluate it, and take it apart to discover its origin. Once satisfied that we have heard and understood, and once we have established that we come in justice and peace . . . then we must pursue justice. We must be bold, we must be constant. We must enter into a conversation with Christ to further our argument. And if – as in the story of Job about which we thought yesterday – we bring an innocent heart to the healer, we may find that which our own heart seeks . . . justice and peace . . . in place of the offered rejection. A re-post from January 13, 2019. The Books of Chronicles, Samuel, Kings, Ezra and Nehemiah all record the events of the rise and fall of the Kingdom of Israel from its founding with Saul and David through to the Babylonian Exile. The point on the timeline where we find today’s reading is after the ten northern tribes secede to form the Northern Kingdom of Israel, leaving the two southern tribes to form the remnant Southern Kingdom of Judah with the old capital of Jerusalem. Today’s confrontation between king and prophet takes place just after the division of the kingdom and just before the death of Ahab. The Chronicler writes with a particular emphasis on Yahweh’s fidelity to the faithful – even when the faithful turn away and fall to worshiping idols. The writer wants the people to remember their heritage, to remember that they would be successful as a nation only if they were faithful to the covenant they had with God, and to remember that truth has a way of revealing itself. Ahab and his wife Jezebel hunt down prophets to exterminate them; they cannot withstand the truth their own seers bring to them. As we recall from our reflection on Naboth’s Vineyard, we know that Ahab and Jezebel use any means to take what is not theirs. They lie, bribe, coerce, plot, scheme, and murder. And with all their attempts to ignore and hide the truth, they end their days in violence that kicks back on them. They suffer the consequences they have wished on others. It is with a certain amount of irony that we hear Ahab say, “When you speak to me in the name of the Lord, tell the truth! How many times do I have to tell you that?” Ahab and Jezebel lie, believing they can bend reality to their will. They scheme, believing they control the universe. They bribe and suborn, believing they hold ultimate power. King pits himself against Prophet . . . Ahab versus Micaiah . . . deceit in competition with light . . . damnation against resurrection. We remind ourselves that when we turn away from a truth we do not want to hear, we take our first step onto a path of sure destruction. If we twist and spin truth to fit our perspective, we walk away from the very lesson that will bring us redemption, union, and happiness. This is the lesson of the prophets, that when we ignore truth, we only postpone the lessons we come to this world to learn. When we avoid truth, we refuse to walk the way of resurrection and light. Adapted from thoughts recorded on February 25, 2007. Today’s Noontime is a story we hear read out to us at least once during the liturgical cycle; it is the story of the people’s relationship with God that takes place during a time when Yahweh’s prophets were being persecuted. It is also a time of high political intrigue when the kingdom brought together under David’s leadership has split in two. Ahab, Jezebel, Obadiah, and Elijah find themselves caught up in the kind of turmoil that guarantees suffering. Elijah, the only surviving prophet of Yahweh, appeals to the people, and allows God to work through him to remind the split nations that despite their petty squabbles God is in charge. The prophets of Baal bring all of their power and influence to bear and still they cannot best Elijah and Yahweh. This is a good story and it deserves enough reading that we can apply it to our own lives. What or who might be the Baal prophets in our lives? Who is it we believe more than God who created us and cares for us beyond all human capacity? Who is it we follow more eagerly than Jesus who redeems and saves us daily? And who is it we love more intensely than the Spirit who guides us and counsels us every minute of our day and night? The humor with which Elijah pits the Baal gods and their prophets against Yahweh makes today’s reading entertaining and authentic. We may want to look for the humor in our own struggle to survive the droughts and famines of our days. And we may want to ask ourselves the same question that Elijah asks his audience: How long will you straddle the issue? If the Lord is God, follow him; if Baal, follow him. We have reflected on Ahab and Jezebel and their fall into corruption caused by their envy of Naboth’s vineyard. Today we see what happens to the seventy princes, their legacy. There is no plan, no ally, no fortification that can withstand truth, light and life. It is unsettling to read about the terrible events that take place as retribution for evil or of the clearing away of what follows upon the heels of deception. Today we read about the end of an evil reign and if we celebrate love as Jesus teaches, there is no joy at the downfall of former foes. He shows by example how to ask intercession for those who both love him and jeer at him. Jesus is willing to speak to the wise among us who hear his words, believe, and act. Jesus also speaks to the foolish among us who hear his words and continue to ignore his call. To be wise, to be foolish: the choice always lies before us. To build on a firm foundation, to build on sand: the work is always before us. To act out of self-interest, to act out of love for others: the action is always before us. We may choose the path of Ahab and Jezebel and see our princes slaughtered. Or we may act like Christ to be open and vulnerable to suffering . . . to be open to eternal joy and hope. Adapted from a favorite written on December 4, 2008. For more reflections on Jezebel, enter her name into the blog search bar and explore. Oh what tangled webs we weave, when first we practice to deceive! My mother’s quoting of Walter Scott’s words peppered our growing-up years. Her use of Scott’s poetic words was her method of teaching the lesson of Ahab and his temper tantrum. Ahab wants something which someone else cherishes and does not wish to give up. Ahab goes home, puts his face to the wall and refuses to eat. His unfortunate wife, Jezebel, colludes with him to get the coveted vineyard from their neighbor, and if we read the entire story, we see what kind of an end these two come to. They both pay a heavy price for their egregious crimes of trumping up false charges, conniving, lying, stealing, inciting a crowd to stone to death an innocent man. Naboth’s mistake or error is merely the cherishing of something that someone else wants. We hear Yahweh’s words through the prophet Elijah in verse 20: You have given up yourself to do evil in the Lord’s sight. Since my childhood, and because of the wisdom of my mother, my family has not worried about belonging to a particular group. When my family opens our home party, all are welcome. Universal hospitality, bridge building to fringe groups, invitations to include all at the table have grown out of my mother’s teaching about Naboth, Ahab and Jezebel. In this year of presidential politics in the U.S., we have become aware of many Naboths, many Ahabs and many Jezebels in the public eye. As we take in the daily news, we recall more words Mother and Dad recited from scripture: The measure that you measure with is measured out to you. Ostracizing others says more about you than it does about the others. There is really nothing that can be kept secret. The truth always comes out in the end. I hope you can stand it when it hits you in the face. What a wonderful gift we are given in the friends and neighbors God sends to us. What a wonderful treasure is the vocation of building community to which we are called. What a blessing to work, play and live beside people with whom we hold things in common, and people with whom we hold little in common. We learn more from our enemies than we do from the people with whom we feel most comfortable. We are all God’s creatures, made in God’s image. What do our daily actions say about the relationship we have with our Creator? Do we turn away in anger when we covet something someone else has? When we open our hearts and homes, are all welcome? Do we extend invitations with ulterior motives? Do we interact with only a select few and bully others to bow to our wants? And when God asks us to invite the faithful to the table, whom are we willing to invite? From a reflection written on June 1, 2008. Tyre is a city off the southern coast of present day Lebanon and it is linked to the mainland by a causeway, or siege ramp, built by Alexander the Great at the end of the fourth BCE. It consists of both a mainland city and an island, has two harbors and most likely because of its vantage point, it was the leading city of Phoenicia in the millennium before Christ. One can read about the early kings of Tyre in the works of the Jewish historian Josephus but it becomes important for scripture readers when Hiram, the king of Tyre, provides pine and the renowned tall cedars to David and Solomon for use in the construction of the Jerusalem palace and temple. Tyre is eventually invaded and destroyed by the Babylonians. Tyre is also famous as the hometown of Jezebel, the wife of Ahab, who convinced her husband to take over the vineyards of the peaceful man Naboth, who persecuted prophets, lured her husband into worshiping the gods of the Baals, and who came to an ugly death . . . just as had been predicted by prophets. (1 Kings Chapters 16, 18, 19, 21 and 2 Kings 9) Hers is a fascinating story of meteoric beauty, power and fame. She was a princess of Tyre, rising and falling in a quick but dramatic arc across ancient history. In today’s reading we read a lament for Tyre and a prediction of her downfall, with the wreck of the ship and all she carries as allegory. The HARPER COLLINS COMMENTARY describes this oracle as beautifully crafted, and Ezekiel laments the anticipated destruction of Tyre at the hands of the Babylonians. This perfect, proud and stately beauty is lost to the storm and settles forever at the bottom of the sea. Thou art brought to nothing, and thou shalt never be anymore. We are creatures meant for joy, not for sorrow. We are children meant for resurrection, not for darkness. We brothers and sisters of the same father meant for life, not for death. Written on April 12, 2008 and posted today as a Favorite. Cameron, Peter John. “Meditation for the Day.” MAGNIFICAT. 4.12 (2008): 129-130. Print.